Our laboratory discovered ion channel-mediated electrical signaling among bacteria that reside in biofilm communities. We are investigating how these “action potentials” in biofilms give rise to emergent collective behaviors in biofilms and beyond. 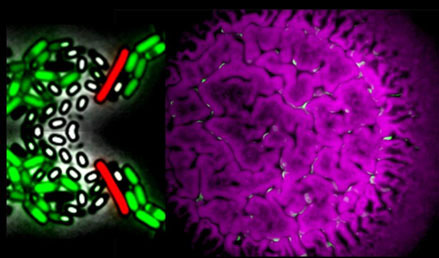 Accordingly, we integrate quantitative biology approaches with mathematical modeling and theory to identify principles of bacterial organization and coordination. Dr. Süel received his PhD in Molecular Biophysics from the University of Texas, Southwestern Medical Center in the laboratory of Dr. Rama Ranganathan and conducted his postdoctoral studies in the laboratory of Dr Michael Elowitz in the Department of Biology and Applied Physics at the California Institute of Technology.